Rotten Floor Joist Repair Is Underway! I’m taking a short break from yapping about hair, makeup and beauty because finally…the rotten floor joist repair is underway here at the Big Creek house! My guys got started yesterday morning, and I’m praying that in a couple of weeks, it will all be done. We are so excited to have this last huge job completed, but there have already been some problems. This is to be expected when renovating an old farmhouse, especially one as old as Big Creek. If you need to get caught up on all the work we’ve done here at Big Creek, you can check it out here, here and here. We moved back into my childhood home almost 2 years ago, and we’ve done extensive repairs and renovations since then. You can catch up on the history of Big Creek here. This floor project is the last BIG job, so we’re super excited to be getting started. Although we knew we’d have to have some floor joists repaired or replaced, we didn’t count on having to repair termite damaged floor joists. That’s just what the guys found yesterday when they got in deep. Thankfully it’s old termite damage; we don’t currently have an infestation thanks to Madre and Papa, who treated the place before we moved in. 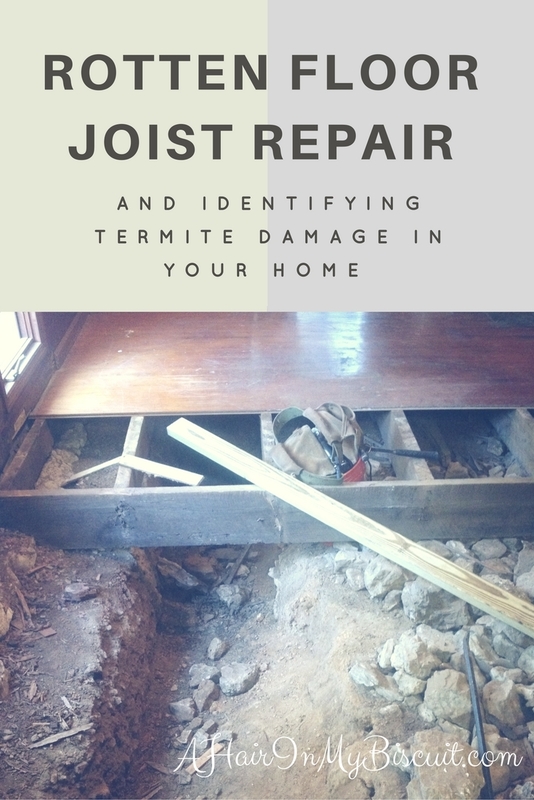 If you have to do some rotten floor joist repair, I hope it isn’t due to termite damaged floor joists. No. Fun. Just to be on the safe side, I placed an order for this Termite detection and prevention kit on Amazon. Identifying termite damage is pretty easy, but not until you get into the nitty gritty. One of the main support beams holding up a weight-bearing wall actually looked like swiss cheese. I nearly had a panic attack when I saw it. If you’re still not sure once you see it, another way of identifying termite damage is to just scrape the wood in question. If it crumbles like dry cornbread, you’ve got a problem! My guys have already started the process of replacing that beam, and the wall is currently being supported by three barn jacks. It’s probably sturdier now than it has been in years! These big ‘ol jacks will be gone, but there will be air hydraulic floor jacks like these living under my house for eternity. I don’t know much about repairing old floors, but I know that Big Creek is being held up by 20 ton house jacks in several other places already, and it will take a few more to keep us above ground level. As you can see, there isn’t much of a crawl space under this old house. As was common 100 years ago, my great grandfather just built the house right on the ground. The joists are actually 2 feet apart instead of today’s 16 inches. Someone down the line already did some rotten floor joist repair in the dining room years ago, and it would probably still be ok if it hadn’t been for those darn termites! There’s plenty to be done to get us sound and sturdy again, but I trust my fellas to get the job done right. In case you were wondering, it’s the same fella (with a different helper) who fixed up our tiny master bath last fall. We’re still loving the bathroom, even after a year. It’s so nice that the toilet doesn’t dance around underneath me anymore (once they finish up the current repairs, maybe the television will stop dancing every time we walk through the living room)! We chose our guy because he was the one Madre hired to do the same type of rotten floor joist repair in the master bedroom after Papa passed away. This wonderful man is getting to know the guts of this old house very well! If you have to take on some rotten floor joist repair in your home, may you find your own trustworthy guys to do the job (unless you’re skilled enough to do it yourself). I also wish for you that you won’t be identifying termite damage under your home! I wouldn’t wish that on my worst enemy. The damage is totally fixable, so I’m not going to get hung up on it by any means. It’s just a huge shock to discover such a terrifying problem. I’ll post an update once all the work is complete, and I’ll include some ‘before and after’ shots. Watching the transformation has been so, so amazing, and I love to share our progress. I adore this house so much, and renovating an old farmhouse has always been on my bucket list. I’ll tell ya this…it’s an experience I only need to have ONCE! 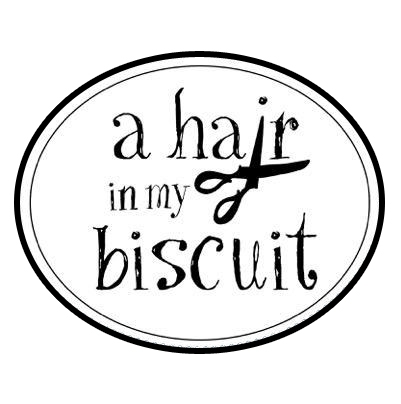 Hairstylist Appointment Book Options	Cute Homecoming Updos | No Time? No Curling! And by proxy, I hope to only live through this once as well. Can’t wait to see it finished! I hope the floors still creak.